Each time I heard “Kitty’s Back,” I would try to figure out the first line, the one before the words “Kitty’s black tooth.” No internet then. Someone eventually told me, and it made sense to me. But that was a very long time ago and I no longer remember what it is and still can’t figure it out on my own. Whether you can always understand what Bruce was saying or not, this was and still is a really great album. Song after song. I never much cared for “Wild Billy’s Circus Story,” but I think it just pales in comparison, considering the songs that are on this album, like “4th of July, Asbury Park,” better known as “Sandy.” This was only his second album, and saw the addition of the late Danny Federici on organ, accordion and such. 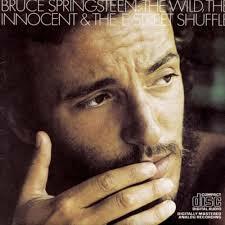 It was also released in 1973, at which time I knew nothing of Bruce. I started with side two, which only contains three songs, all vivid stories. It begins with the rarely heard “Incident on 57th Street,” which, when heard on the radio always leads right into one on my two favorite Bruce Springsteen songs, “Rosalita (Come Out Tonight).” That was always exciting for me, when they’d play the first song and I knew, because as one DJ said, “it’s the law” due to the connecting piano piece, that they would play the song that turned me. It’s the first one I saw him perform, and yes, Bruce is a great songwriter and arranger, but he is also one amazing performer. Sure, by that time I had heard “Born to Run.” It was background music in a bar or on the radio, and it had caught my interest because the woman’s name in the song is Wendy and that was one of my mother’s nicknames for me (refer back to Peter Pan). One day or night, I was watching something on TV, pre-MTV, that showed a clip of a Bruce in concert performing “Rosalita.” I was intrigued by him and the song, and then even more so when two girls rushed the stage, practically knocking him down to kiss him. One got him good and he didn’t protest until after they were pulled off of him. And then he went on to finish the end of the song. I thought it both funny and cool. I’m doing this from memory, so I have to wonder how much of that I made up. I recommend if you like good music, you take a listen and turn it up to eleven. Oh, and this album has just bumped Delaney and Bonnie from their Ram 2 spot. So close, but they had a good run. ← March 9 – Sunday – Bruce Springsteen – Greetings From Asbury Park, N.J.